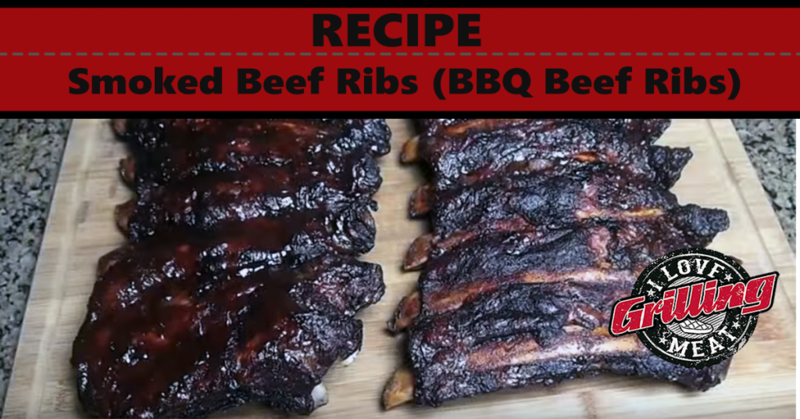 Follow along with this smoked beef ribs tutorial and you will surely be amazed at your results! When shopping for beef ribs, try looking for the same things that you would be if you were shopping for steak (for example, a lot of marbling). Beef ribs come from the same cut of meat as your rib roasts (prime rib on qualifying animals), so in most cases you will have good meat anyways. To prepare the meat, remove the membrane on the inside of the ribs. This can be tricky some times, but usually after you peel off the first bit with a knife, you can rip the whole membrane off in one piece. If there are any hard chunks of fat under the membrane, remove those too, as they do not render down as easily. After you have cleaned the ribs, apply the rub on both sides. When you are done, get them in a plastic bag/zip lock and let them set in the fridge for a couple of hours. This lets the meat soak up the flavors of the spices. You can now put the ribs in the smoker. You can use pecan wood or any other wood of your preference in the smoker to add to the flavor. Smoke for about 4 to 5 hours. When the smoked beef ribs are about 45 minutes away from being done, you can apply a sauce of your preference. Let the meat relax for a little bit. Then cut them up, and enjoy your smoked beef ribs! Smoked Beef Brisket Recipe (Burnt Ends Included) A step-by-step method for the perfect smoked beef brisket, strictly Texas style. While many people prefer to trim the point off the brisket, today we are doing a medium trim-down. We will also keep the rub very simple, just salt and pepper, and will be smoking with Mesquite wood on the offset smoker.